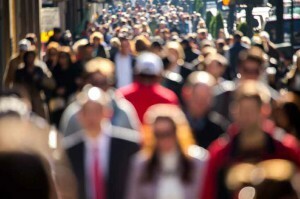 The Housing Industry Association has analysed the latest ABS demographic statistics. The figures showed that Australia’s rate of population growth slowed in 2014. This development coincided with a period when the nation built more new homes than in any other year on record. 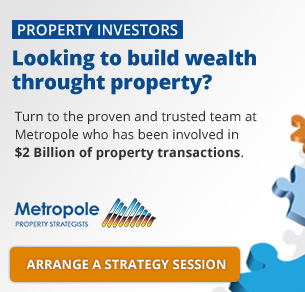 This dynamic has generated some interest, particularly in light of this week’s data updates being‘housing-heavy’, with releases from the HIA, the ABS, and CoreLogic RP Data. The ABS figures show Australia’s population reached 23.63 million at the end of 2014. This was an increase of around 330,000 people over the year and amounts to 1.4 per cent growth. After reaching a peak rate of 1.8 per cent in 2012 (when the population increased by 400,500 people), the pace of population growth subsequently slowed throughout 2013 and 2014. The deceleration in growth has been a focal point of commentary following the ABS population release. Much has been written about this aggregate profile – we are not going to revisit that here, rather, we’re considering the internal migration and population dynamics currently at play. The picture portrayed by the national-level figures is not representative of population growth and migration patterns in individual jurisdiction around the country. The states and territories had quite divergent experiences with regard to overseas migration, and when delving down below the national level there is the added complication of interstate migration flows. 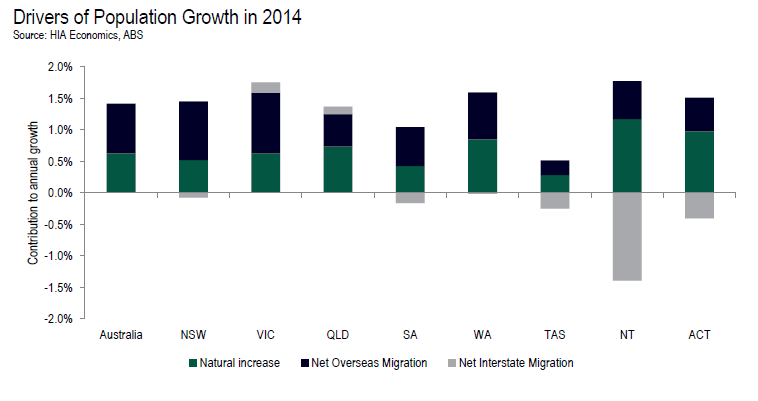 Population growth in New South Wales and Victoria has performed particularly strongly during 2014. In contrast, Western Australia and Queensland are in the midst of a post mining boom economic adjustment and these saw the rate of population growth slow. As a smaller and less diversified economy than WA or Queensland, the Northern Territory is more susceptible to population shocks and the post mining boom adjustment appears to have arrived in the form of an exodus. Demographic development in South Australia and Tasmania reflect their status as the nation’s two most underperforming state economies. These two states experienced significant population losses as a relatively large number of residents moved interstate. SA and Tasmania also experienced a lower net contribution to their respective populations from overseas migration. Similarly, the Australian Capital Territory recorded relatively significant losses through interstate migration, although this was partially offset by a slight lift in net overseas migration. In terms of population growth driving strong housing demand in the current cycle, the two states of most prominence are NSW and Victoria. The population of NSW increased by 1.4 per cent (103,011 people) in 2014. While this was a slightly slower pace than in the previous year, it is still a relatively strong rate of growth for the state when compared with a 25 year average of around 1.1 per cent per annum. Firstly, there was a significant improvement in the balance of interstate migration. While the state still recorded a net annual loss in population due to interstate migration (as it has for more than 20 years), the size of the loss more than halved in 2014. Secondly, while the national rate of overseas migration slowed in 2014, this was not the case in NSW. Net overseas migration in NSW increased in 2014, recording 1.9 per cent more migrants than the previous year. The population of Victoria increased by 1.8 per cent (101,521 people) in 2014, which made it the fastest growing state in the country last year. While this pace was still slightly slower than in the year prior, it is still a strong rate of growth for the state when compared with a 25 year average of around 1.2 per cent per annum. While strong growth from net overseas migration provided the lion’s share of the latest growth (albeit by a smaller amount than the previous year), beneficial developments in the balance of interstate migration provided the cream on top. The net inflow of migrants from other states to Victoria in 2015 increased by 24.0 per cent compared with the previous year, and this took the level of interstate migration to a record high. Despite the deceleration in the national rate of population growth, the current population growth dynamics in our two largest states remain supportive of the strong demand for additional housing evident in the market at present.